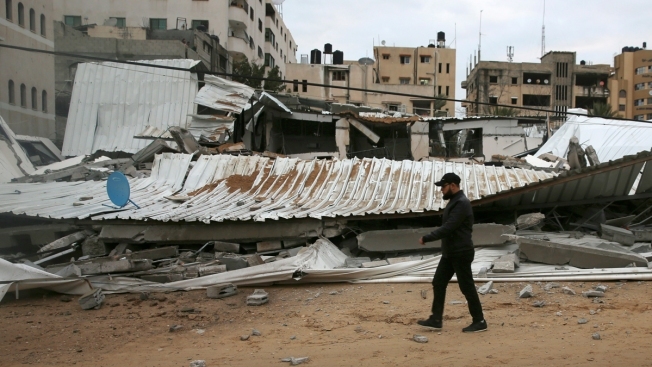 A Palestinian inspects the damage of destroyed building belongs to Hamas ministry of prisoners hit by Israeli airstrikes in Gaza City, early Friday, March 15, 2019. Israeli warplanes attacked militant targets in the southern Gaza Strip early Friday in response to a rare rocket attack on the Israeli city of Tel Aviv, as the sides appeared to be hurtling toward a new round of violence. Israeli warplanes on Friday struck some 100 Hamas targets in the Gaza Strip in response to a rare rocket attack on the Israeli metropolis of Tel Aviv. Rocket fire persisted into the morning, setting the stage for additional possible reprisals. The sudden outbreak of violence comes at a sensitive time for both sides, and it appeared that Israel and Gaza's Hamas rulers had incentives to end the fighting. Hamas, meanwhile, is coping with its own domestic troubles. Israel and Egypt have maintained a crippling blockade on Gaza since Hamas took over the territory in 2007. The blockade, along with sanctions by the rival Palestinian Authority and Hamas' own mismanagement, have fueled an economic crisis that has driven unemployment over 50 percent. The crackdown triggered heavy criticism on social media, raising the possibility that the rocket fire was a diversionary tactic. The organizers of a weekly protest along the Israeli border said they would cancel the demonstration in the wake of the escalation. Hamas, which typically claims responsibility for its military actions, denied involvement in the rocket attack on Tel Aviv and even said it had undermined its interests. But Israel's military said it had concluded the group was behind the attack. "The IDF holds the Hamas terror organization responsible for all events transpiring in the Gaza Strip and emanating from it," the military said in a statement. The late-night attack Thursday on Tel Aviv, Israel's densely populated commercial and cultural capital, marked a dramatic escalation in hostilities. It was the first time the city had been targeted since a 2014 war between Israel and Gaza militants. Israel and Hamas have fought three wars since the Islamic militant group seized power in Gaza in 2007. Smaller flare-ups have occurred sporadically since Israel and Hamas fought their last war, in 2014. Smaller Salafi groups inspired by the Islamic State group also operate in Gaza, though it is unclear whether they have powerful rockets capable of striking so deep inside Israel. Brig. Gen. Ronen Manelis, the chief Israeli military spokesman, said the army had been caught off guard by Thursday night's rocket barrage and had no advance intelligence. Israeli Cabinet Minister Naftali Bennett, a hard-line rival of Netanyahu's, called on the prime minister to convene a gathering of his Security Cabinet and demand the army "present a plan to defeat Hamas."